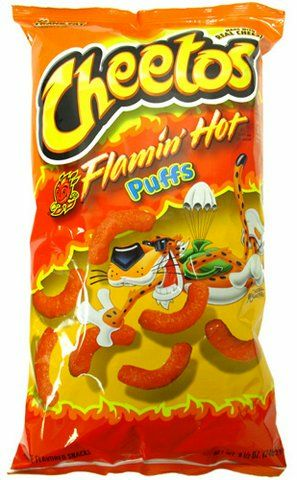 For a snack that hits the spot munch on Cheeto's Flamin Hot Puff snacks. Made with real cheese you'll love the atomic red powder that gives the Cheetos their zest! Ingredients: Enriched Corn Meal (Corn Meal, Ferrous Sulfate, Niacin, Thiamin Mononitrate, Riboflavin, And Folic Acid), Vegetable Oil (Contains One Or More Of The Following: Corn, Soybean, Or Sunflower Oil), Maltodextrin, Salt, Sugar, Artificial Color (Red 40 Lake, Yellow 6 Lake, Yellow 6, Yellow 5), Monosodium Glutamate, Autolyzed Yeast Extract, Partially Hydrogenated Soybean And Cottonseed Oil, Citric Acid, Hydrolyzed Soy Protein, Cheddar Cheese (Cultured Milk, Salt, Enzymes), Whey, Onion Powder, Whey Protein Concentrate, Corn Syrup Solids, Natural Flavor, Buttermilk Solids, Garlic Powder, Disodium Phosphate, Sodium Diacetate, Sodium Caseinate, Lactic Acid, Disodium Inosinate, Disodium Guanylate, And Nonfat Milk Solids. Contains Milk And Soy Ingredients. 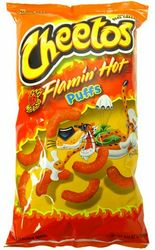 Es una deliciosa botana que satisface tu antojo, asi que debora los cheetos flamin' hot! Ten encantara el polvo rojo atomico que le da a los cheetos su rico y picante sabor! Ingredientes: Harina de ma�z enriquecida (harina de ma�z, sulfato ferroso, niacina, mononitrato de tiamina, riboflavina y acido folico), aceite vegetal (contiene uno o mas de las siguientes acciones: maiz, soya, o aceite de girasol), maltodextrina, sal, azucar, colorantes artificiales (Laka Rojo 40, Laka amarillo 6, amarillo 6, amarillo 5), glutamato monosodico, extracto de levadura, aceite de soya y de semilla de algod�n parcialmente hidrogenado, acido citrico,proteina de soya hidrolizada , queso cheddar (leche cultivada, sal, enzimas), suero de leche, Cebolla en polvo, concentrado de prote�na de suero de leche, solidos de jarabe de maiz, sabor natural, solidos de mantequilla, ajo en polvo, fosfato disodico, diacetato de sodio, caseinato de sodio, acido lactico, inosinato disodico, guanilato disodico, y de solidos de leche sin grasa. Contiene ingredientes de leche y soya. Around Halloween our stores had flamin' hot bag of bones cheetos and these are the closest thing i can find. My daughter and I love them. Although she says these are hotter than the bag of bones puff. I am not sure they are but perhaps slightly. They were great but three of the six bags I got were popped when I opened the box other than that I got exactly what I ordered and loved every bite. These aren't sold anywhere near where I am currently stay at for the time being but they have them back at my house and i was craving them for days before I even bought them. Exactly as described. 8.5 sized bags. Fresh. Delivery on time. Quick response to questions. ProsFresh. Big bags. Kids love them. My order came fast, and I live in Maryland and I couldn't not find them anywhere. I'm so happy that I found them and I will be ordering from this site again. I just went to pick up my package and i came for a little suprise they were 9 1/2 oz ! I was so happy to see them deff will be ordering more often thank youu! I buy these for my sister because she loves them. In fact, better than the crunchy ones. I like them and they're good, but they're a bit too hot for my taste! Anyway, as long as my sister has no problems enjoying and eating them, then I'll keep buying them for her when she needs a hot and cheesy cheese puff fix! ProsTaste is good. Taste is fresh. Hot & Cheesy! I can't find these in grocery stores anywhere in my area. They're my favorites. Even better than the crunchy ones. Unfortunately, both times I ordered them, some of the bags arrived open. I think they need to do a better job of packaging these for shipping. Awesome! You'll love them! I can't find them anywhere on the east coast and was so happy when I found them here. I ordered 20 bags and will probably order more soon. I'm from NY and can't get these here so when I found them online I jumped at the chance. Not being a chip eater in general it speaks volumes that we buy these. If you crave spicy eats you will definitely love these too!